Oh, pregnancy. I've settled into it deep. It isn't new and it isn't almost over. It's just thick and normal and it sits in my mind, a default mental state of anticipation. It takes over during quiet moments and buzzes louder and louder until someone asks me for help fastening their shoe or hair clip or superhero cape, interrupting the chatter in my head. I've done this enough times to observe that I am going through a process. The questions that I keep asking myself (the who and when and how kind of questions) can't be answered -- not by my midwife, not by my mom, not by Google -- but I recognize now that asking them helps me feel ready, mentally, to labor, to deliver a baby, and to make a space in our family for someone we don't know yet. I have stood in completed nurseries in other years, listening to the same buzzing, touching tiny blue and pink things, and trying to stretch my brain big enough to see into my stomach and glimpse the person who would live in that baby-room and wear that baby-stuff. Of course it didn't work. Clark and Alice were and are so much more than what I saw or felt or dreamed during those days. I had a suspicion when I first saw their faces, and they keep proving it more and more with every passing day and every bit of unique complex personality that emerges. 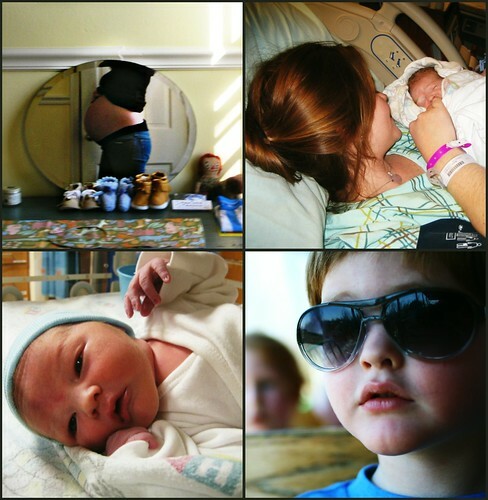 I am stretching my brain again, grasping for invisible clues to what this boy will be like. Fourteen weeks to go. 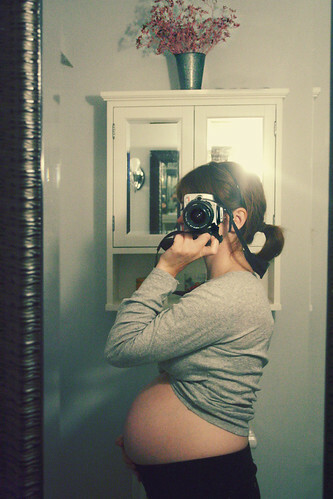 If you ever want to lure me over to a blog quickly, just say "belly shot." Lol. I am a SUCKER for belly shots. And yours in quite cute, and it definitely didn't disappoint. Really loved this post, Erin. You so perfectly described how we mamas feel about our babies before they arrive in flesh on the outside. I love this post. So beautiful in every way. You are getting so close! If you lived near me you'd be seeing me so often, I wish I could come be a better friend to you. I hope you have a great week. & you look beautiful. As always. I remember those thoughts. They'd plague me as I was falling asleep. How will the delivery go? What will it be like? Will this be a boy or a girl? Will I be able to handle motherhood? WILL I EVER SLEEP AGAIN? And then, with the second pregnancy, same exact questions. Not even a little bit less noise in my head. You are a beautiful, beautiful pregnant mama. Thanks for verbalizing what so many of us went through in the privacy of our heads. Gah. I love this post and I love your preggo shots. I'm only on the second baby and I can't believe how fast it is going, I can't imagine the third and how different that will feel. I can't wait to meet your little boy. you look beautiful!! i'm experiencing so many of those same thoughts right now ... wish i could come and sit and chat a while. You are so beautiful! I miss being pregnant so much, thanks for sharing! You look absolutely gorgeous! I mean, you ARE gorgeous. Oh, you're so beautiuful! I love this post. I've been stretching my brain too lately. Wondering yet knowing that I can't know. The unveiling of these little people's big personalities is slow and beautiful (and sometimes very frustrating ;). What a beautiful belly and a wonderful post! You are so beautiful, lady. I love this post. SO much. LOVE this!!! Your kids and your pregnant belly are gorgeous. What a lovely compilation of photos. You look beautiful and, of course, your "babies" are adorable too. Lovely post. Yay! I completely understand. Sorry I Haven't stopped in in a little while. I've been Pregnant and tired and making room for baby #3 as well. oh man. this post made me all emotional. 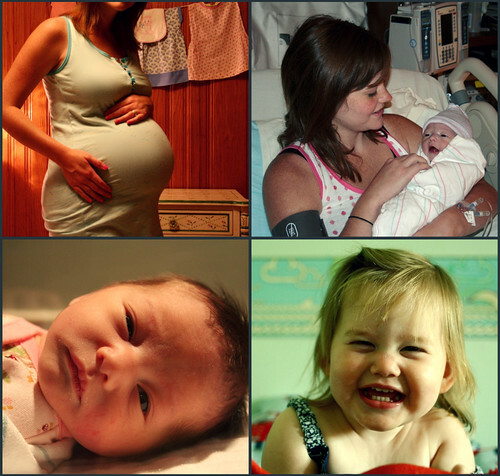 you are a beauty of a mom, a writer, and an erin. i'm glad you're here. leave me a comment so we can be pals. i'm erin. friendly but flaky. collector, overthinker, inconsistent, and trying my hardest.